Can’t expect to use Geico and save 15% or more on something that’s banned from drag strips. A million dollars can buy many, many things. Smart gear heads would invest the majority of that cash and spare $84,995 for something like, say, a Dodge Challenger SRT Demon. The problem is that the Demon has borderline irresponsible amounts of power, enough to corrupt even the most conservative of professional drivers. When that happens, that cool million might have to go towards paying settlements, hospital bills, and damages (good luck having any left for race fuel). Except Hagerty Insurance Agency won’t let that happen. 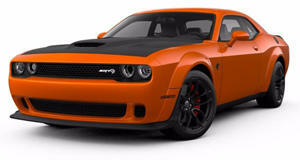 The insurance company, best known for providing policies to owners of classic cars, has announced that it will be the official insurance partner for the Dodge Challenger SRT Demon. You’d think that all the flame Dodge talked when trying to put the Demon on a pedestal—including when it made mention of the NHRA’s drag strip ban on the muscle car—would have deterred any insurance company from taking that much of a risk, but Hagerty is a company made up of enthusiasts and it would rather see all 3,000 US owners and 300 Canadian buyers get to drive their precious beasts on the streets rather than let them collect dust on their garage-based thrones. Hagerty hasn't unveiled how much the premiums would cost, but it did leave a link to its hotline so that owners can call and find out for themselves. “We are living in the golden age of automotive performance, and the Demon is the latest example that speaks directly to the hearts of enthusiasts,” said McKeel Hagerty, CEO of Hagerty. “The insurance industry had a hand in ending the first great muscle car era, and we’re here to make sure history doesn’t repeat itself.” Dodge is of course appreciative and supportive of the helping hand, having hashed out the deal with the insurance company for what will undoubtedly be one of the most crash-prone muscle cars on the road aside from the Mustang of course. “We didn’t build the Demon to be a halo car that never sees the light of day – we want to make sure that Demon owners have access to the insurance they need to get these cars out on the street, for all the Dodge//SRT enthusiasts to see and appreciate their performance,” says Tim Kuniskis, Head of Passenger Car Brands for Dodge and SRT. Now, onlookers can rest assured knowing they’re safe from financial liability if they see a Demon heading towards a crowd when leaving a Cars and Coffee.